One of my favorite things about digital stamps is how I can use them with my traditional supplies and get more bang for my buck. I used the cupcake stamp from my new Love grows here digital stamp set and the sketch from 2s4u, assorted rubber stamps and bits of wrapping paper to make this card. *Buy this and/or any other of my stamp sets/commercial licences at MyGrafico before Midnight (GMT) and save 20% on your entire purchase with coupon code: MG2010! 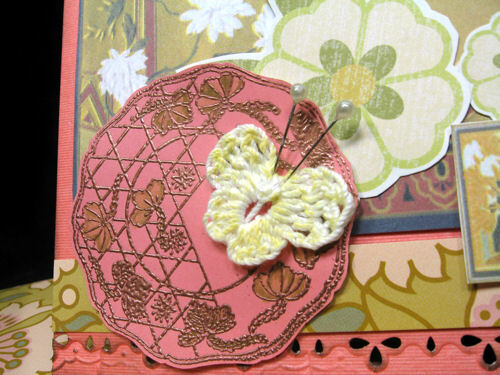 I used a stamp wheel to make the design on the pink paper. The ledger paper strip is digital, the blue scallop strips is wrapping paper (I like the paper more than the gift it was wrapping!) and the postage stamp is a die cut from Ellison that I masked with a post-it and stamped, fun! On the there of recycling I am posing a challenge, make a card with a digital stamp (any company) include something recycled in it (like a clothing tag, old buttons, cardboard, etc.) and leave me a comment with a link to your card or join my What’s Digital stamping Yahoo Group and post it in the photo section and I will put your name in a drawing for your choice of a stamp set! You have until next thursday to enter, good luck! 9 cute digital stamps in png and jpg format! Here is my new Sweet Stuff digital stamp set, I took 11 of my most popular stamps, and wrapped them up into this set. They are in png and jpg format to offer you the most versatility! 11 sweet digital stamps in png and jpg format for $5! Next week the Design Team will be back from holiday with loads of inspiration (I’m excited, aren’t you?) til next time happy crafting! Here is the box, it is made by taping 3 different sized rectangles of foamcore together. I have a hook on one of the sides so I can photograph hanging projects like ornaments or necklaces. I just turn the box however best fits my project. I used plain ol’ masking tape to put it together. I made this box about 3 years ago and I use it daily so as you can see it is sturdy (it’s also a bit grimy so I’ll need to make a new one soon 🙂 } it is also cheap to make, all you need is a sheet or two of white foam core and you can get that at the dollar store or wal-mart on the cheap! Other than that you need a utility or craft knife, a metal straight edge (ruler) and a roll of masking tape. 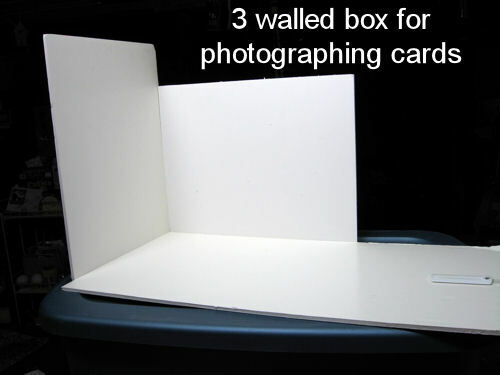 cut 3 rectangles of foam core and tape them together on the back to make a 3 walled box, easy peasy! 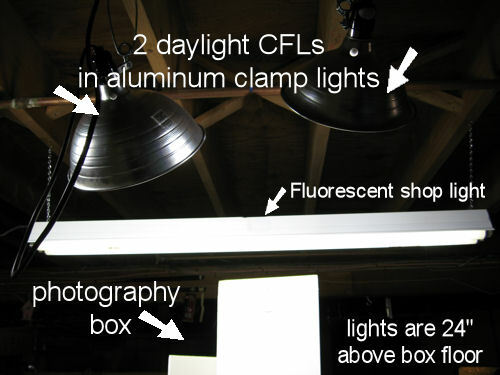 the daylight CFLs shine at a 45 degree angle towards my photobox and the shop light provides an all over light. It was lucky for me that we have a pool table under the flourescent light, I simply put a large plastic storage tote on the table and my photobox on top of that to get it close to the light. I like to shoot my work on white most of the time but if I decide to use a background cloth I make sure I have part of the white box showing (I will crop it off later) so I can white balance it if I need to when editing. I don’t use the camera flash. usually I open my photo in Paint Shop Pro, click adjust then curves and select either levels or contrast. If it still doesn’t look right I balance it by clicking on the white eyedropper icon, then on a white spot on the photo, and black if need be. Here is the same project shot on white. Have fun experimenting with your artwork! I hope this helps anyone interested in taking good photos of their cards and artwork. Thanks for stopping by and till next time happy crafting! The stamps in this kit are so fun and easy to cut out too (I usually avoid fussy cutting but these were quick and easy to cut! Tip: when coloring an image you plan to trim closely color outside of the lines, it's quicker and looks nicer! I'll send this card to Mom to thank her for the wonderful Christmas goodies! Now for the freebies! With all of the wonderful gifts I got for Christmas I need to send some Thank You cards so here is a thank you stamp to thank you for visiting mu blog, you can resize it to fit your circle punches so trimming is a breeze! 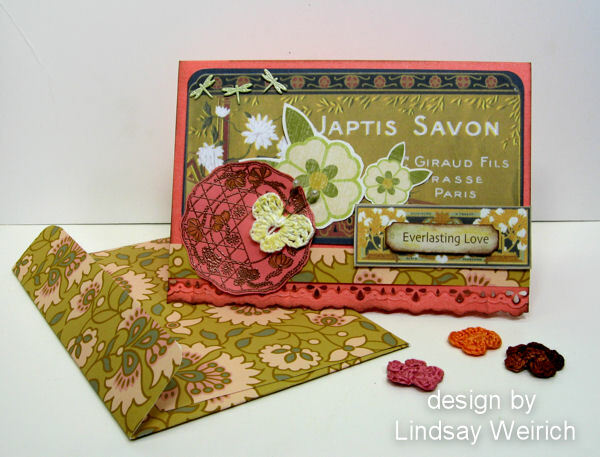 I am also throwing in the little vintage labels I used on the bird card cuz I love a bit of vintage in my valentines! Click the picture to download! Here is this weeks freebie, click to download, enjoy! I have my Monday crew the day off so they could enjoy the holiday with their families, be sure to check back next monday as we are adding a new designer to the Lindsay’s Stamp Stuff team! Until next time Happy Crafting! Have a wonderful day and till next time happy crafting! A quick box I made today, it holds a surprise for a dear friend! This project was inspired by a project by Liz Miller that I saw in The Decorative Painter, she had 2 cute painted bags made out of watercolor paper and I knew it would be perfect to adapt to use with the Scor-Pal and my Digital stamps! To make the template for the flap I folded a 3.5″ wide scrap of paper in half and cut a curvy shape from it and traced it to the flap area (the red scrap paper in the photo is my template.) Now that I can see where the front of my box is I transferred my stamp. Wet the paper, all except the snowman and paint with blue and mauve, sprinkle salt on the blue while the paint is wet and viola! snow! After the background is dry paint the snowcouple. I made some faux snow by rubbing two styrofoam balls together and gluing the sprinkles to the bottom of the box. 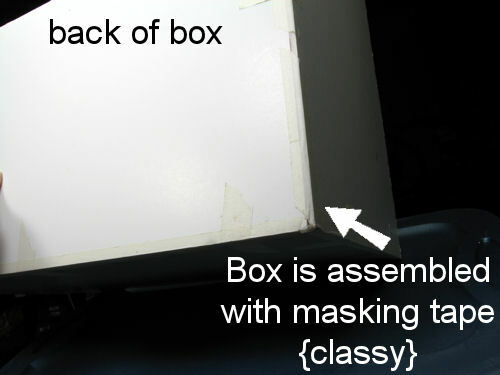 I used scor-tape to secure the box side and bottom. I used my letterpress plates on the tag. Valentines Day is right around the corner, get crafting with this kit! 11 of my most popular designs rolled into one set, sweet! I can’t wait to play with the Valentine stamps! Til next time have a wonderful holiday and happy crafting! OK, todays post is not for my regular readers, it is for their husbands, boyfriends and non crafty friends. It’s 3 days before Christmas and you are wondering what to get your crafty loved one. Here is a list, print it and take it to the craft store or if you have one your locally owned independent scrapbook/stamp/craft shop. The one thing almost every crafty friend I have wants (if they don’t already have it) is a Cricut Expression. This is a digital die cutting machine that sells anywhere from $200-$500. You an even find these machines at walmart as well as the big craft stores. Call around and see who has them in stock and the best price. There are 2 smaller Cricut machines that are a bit cheaper but many folks who buy the smaller one want the larger one. If they have a cricut take a peek on their computer and see if they have software to use it with. The cool thing about software is that they can get a lot more use out of there machines. I like Sure Cuts a Lot (SCAL) software because you can call your computer fonts with it and you can convert clip art to cut with it. It is $75 and you can order it and download it from the website instantly (not going to the store on December 22 is a good thing!) they will email you the activation code that will allow you to run it instantly. This is available for PC and MAC computers;) You can use this coupon code:8665847 to save 10% of SCAL right now! Cricut Design Studio is good if she has a bunch of cartridges because you can only cut designs from the carts you have. 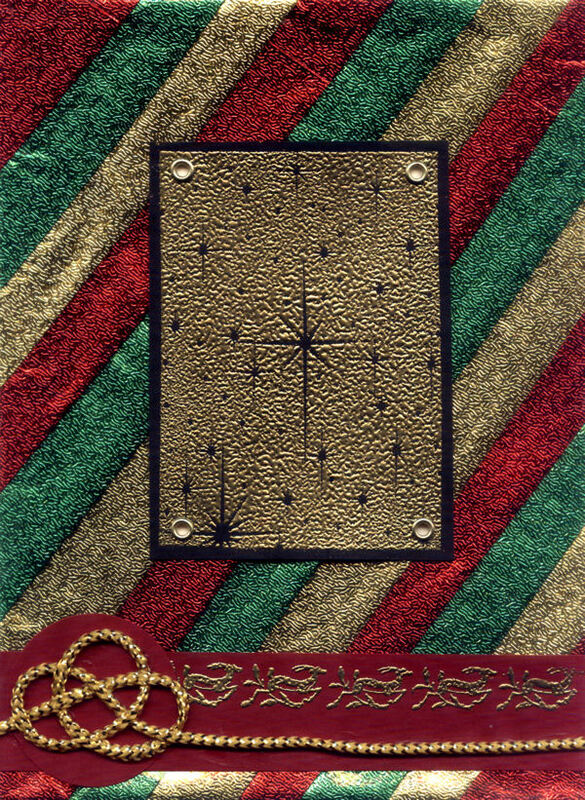 Cardstock: You can’t go wrong with cardstock for card makers or scrapbookers. 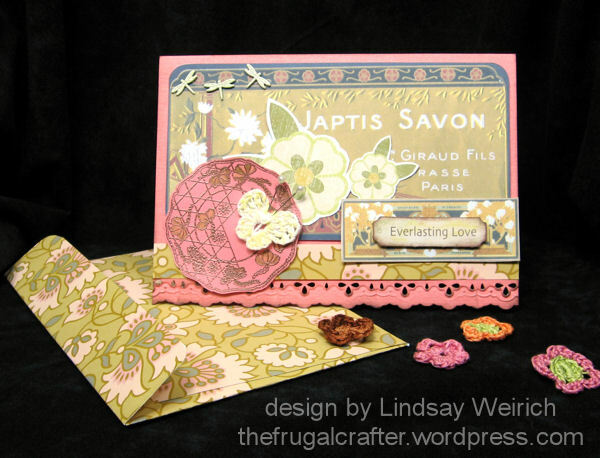 I love Die cuts With a View, Bazzil, and Co’ordanations brands. You can find them at most craft stores and they are good quality. Knitters love fun novelty yarns, a ball of funky yarn can go along way as a trim or a scarf, grab a few fun skeins of yarn to fill her stocking with. Whatever the craft your lady enjoys she is going to love whatever you choose because it is so sweet of you to take th time to shop for crafts, big hugs to you, and have a merry christmas. If your crafty friend is a guy sorry about all the “shes” and “hers”, have fun shopping ant til next time happy crafting! The year at a glance, my 2010 calendar pages with 2009 photos. Just a reminder that all of the stamp sets in my shop are buy 2, get one free. If you are shopping at the Lindsay’s Stamp Stuff Shop at MyGrafico you order your two Lindsay’s stamp sets and when you go through the checkout you need to write the Lindsay’s stamp set you want for free in the comment box and you will get that set emailed to you separately. This special is available in my shop only so you cannot combine sets from other designers at MyGrafico to get the deal;) Let me know if you have any questions.